Whatever kind of riding you wish for – you will find it in the South of Scotland. This region is renowned for having some of the best horse riding country in Britain and a guided ride is a perfect way to enjoy the area’s stunning beauty. Ride on the green rolling hills, ride on a beach, or explore forests and romantic valleys. The choice is yours! Our friendly horse riding establishments will cater for all your needs. Qualified and experienced staff will guide you through the stages, whether you are a complete beginner or an advanced rider. You don’t have to be an expert to experience the freedom that riding offers! 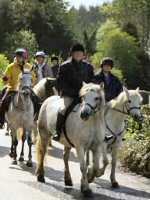 Please click on the links to the left to find out where riding & trekking centres are located.